Thai cuisine is a food group that encompasses a wide variety of flavors, ingredients and history all to create a flavorful and historical meal full of symbolism and culture. In a broad sense, Thai cuisine is lightly prepared with strong aromas and spicy undertones. It is a general goal of Thai meals and cuisine as a whole to always combine balance, detail and variety and to involve the four fundamental tastes, sour, sweet, savory and bitter in every dish or in every full meal. Thai food has a lot of historical and geographical significance as food in each region is related to the food in the countries that surround specific areas of Thailand, i.e. Northern Thai food is very similar to Burmese food, Northeastern Thai food is very comparable to food seen in Laos, Central Thai food is analogous with food enjoyed in Cambodia and Vietnam and Southern Thai food is akin to food eaten in Malaysia and Indonesia. Within these different geographical areas, cuisine variations depend on culture, climate, geography and ethnicity. Aside these four major regions and food types, there is also a fifth type known as Thai Royal Cuisine that traces back to the Ayutthaya Kingdom and is seen more widely throughout the whole country (Thailand Today, 2011). Unless you are eating alone, it is customary in Thailand for each person to be served rice and then serve various dishes family style around the table for the whole meal. In general it is thought that more dishes should be served than there are people at the table. Traditionally, one was to only eat with their right hand, using only a fork, while seated on a floor mat. More modernly, eating has been extended to a table, from a fork to both a spoon and fork to be used by both hands. It is still uncustomary though for any knives to be on the table (Walker, 2013). 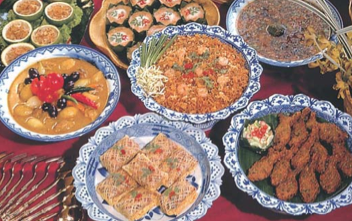 There are several main ingredients that combined form the majority ofThai Cuisine. Some of these include fresh herbs and spices, ginger, tamarind, soy beans, chilies, nam pla (fish sauce), nam pririk (chili paste), jasmine rice and noodles. Though most Thai dishes favor beef, pork, chicken, and fish, certain insects are also eaten throughout the country but most prominently in the Northern region. Often in markets one can find deep fried grasshoppers, crickets, silk worm and termites. Often these insects are deep fried together with kaffir lime leaves, chilies and garlic to make a favorite Thai snack. Reptiles are also featured heavily in Thai dishes. It has been explained that historically insects and reptiles were eaten as a result of extreme poverty which pushed the Thai people to turn to these foods for sustenance. As a result, they became traditionally engrained into Thai cuisine. Thai insect eaters can be found in all regions of the country. Most recently edible insects have been added to canned foods and snacks that are sold as commercial products (Siriamornpun, 2008). As explained previously, the five main flavors combined in all Thai recipes are spicy, sour, sweet, salty, and bitter. The widespread practice is that herbs that are used in Thai dishes are cooked fresh and are never dried. This is what gives Thai foods their strong, aroma and taste. Fish, meat and beans (most specifically soy beans), are commonly found in Thai dishes and fruit is often used as flavoring. Because the topography and climate is diverse in different areas of Thailand, Thai cuisine is also very diverse depending on what can be grown in the local area. Because food in Thailand is grown and consumed locally, the foods available vary from season to season. Vegetables for instance, are harvested at different times of the year and, therefore, are popularly used in meals during their time of harvest. Fish yield is also dependent on the water level of the rivers when and where they are harvested (Thai Food Tonight, 2013). hand combines the flavors of sweet, sour, and spicy. This dish includes garlic, chilies, green beans, cherry tomatoes and shredded raw papayas which are crushed in a pestle and mortar and mixed into a salad of noodles. It is easy to see that these two dishes obviously differ in location, ingredients, and taste (Bangkok.com, 2013). Thai cuisine is known to encompass a wide variety of flavors, ingredients and is based on much of the country’s history. The general goal of Thai cuisine as a whole is to always combine balance, detail and variety and to involve the four fundamental tastes, sour, sweet, savory and bitter in every dish. However, because the topography and climate is diverse in different areas of Thailand, Thai cuisine is different depending on what can be grown and harvested in the local area.